The Fort Bend County Sheriff's Office is accomplishing a new goal by utilizing new technology in the county jail, including a food ordering app and video visitation capabilities. To accomplish this effort, the Sheriff's Office is partnering with two companies -- Securus Technologies and Aramark. Aramark provides food services to the Sheriff's Office. 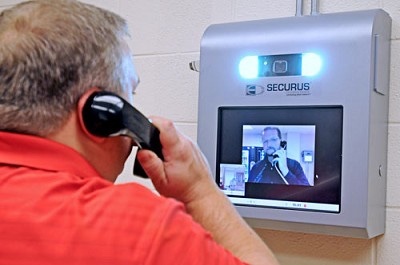 Securus is unveiling new video visitation terminals and SecureView Inmate Self-Help Tablets with Aramark's Correctional Commissary Application. Aramark's Commissary ordering app is being integrated with Securus' Visitation Terminals or SecureView Inmate Self-Help Tablets. This is testament to both companies working toward a common goal. "We have been a big proponent of using technology and customizable solutions in an effort to improve the culture and environment for which incarcerated individuals find themselves," said Sheriff Troy Nehls. "The safety and security of inmates and staff revolves around having a positive living and work environment. When inmates feel they have nothing positive in their lives, bad things tend to happen." Inmates have the opportunity to utilize the tablets at a small cost. They can order food as well as read selected material to keep them busy. "It not only makes it easier and safer to manage our inmate population, it allows us to create an environment that offers inmates access to phone calls via their tablets, At-Home video visits, e-messages and electronic requests with staff," said Nehls. "Again, this is testimony that the Fort Bend County Detention Facility is one of the finest, efficient and professional facilities in the nation."